Boys and girls love playing with wooden farmyard sets – almost as much as their parents! There’s a growing movement against mass-produced plastic toys, with wooden toys such as farmyard sets becoming more and more popular. Wooden farmyard sets are more sustainable, better for the environment and will look more stylish in your home, too. The best wooden farmyard sets are suitable for young pre-school children and will continue to provide enjoyment well into their school-age years. However most toy farms are labelled as being suitable for 3 years and above – partly due to details such as sharp corners, and partly as it’s more expensive for toy manufacturers to test their products for younger children. This is a shame for 2 year olds who are old enough to enjoy a wooden farmyard set, and often miss out. I’ve found some lovely wooden farmyard sets which are designed for children from 2 years old and above. 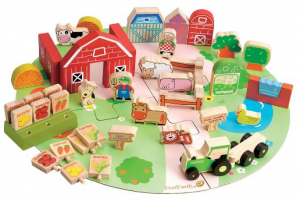 The Everearth wooden farmyard set is quite unique due to its circular jigsaw-shaped board. With 53 separate pieces, it provides a huge amount of variety which will keep 2 year olds and older children entertained for hours – and even years. 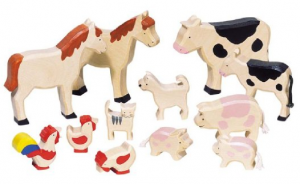 This farmyard set is made from ethical FSC wood, making it a nice eco friendly toy. It includes various animals (pig, sheep, duck with pond, cat and dog), stable, barns, trees, fences, tractor with trailer, combine harvester, vegetable patch, crops and toy farmer dolls. Instead of restricting a child’s imagination – as so many modern toys do – it can be used in endless ways, providing unlimited imaginative play. I particularly love the jigsaw board, which is a lovely idea. It’s perfect for children who enjoy doing jigsaws. The 4 pieces are simple enough for 2 year olds to start figuring out how to join together. If you’re buying for a 2 year old who’s not quite ready for a full farmyard set then it’s worth looking at a wooden farm shape sorter instead. 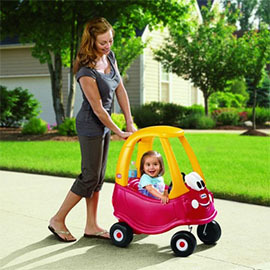 Shape sorter toys are ideal for 2 year olds who are learning how to use their hands in more accurate ways. 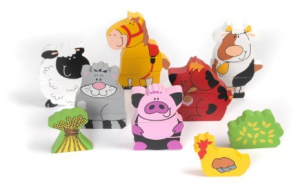 The Leomark wooden farmyard shape sorter contains a lovely set of farm animals. Each animal is a different shape, allowing young children to experiment with fitting them into the different holes. There’s even a working door and window, making it more realistic. 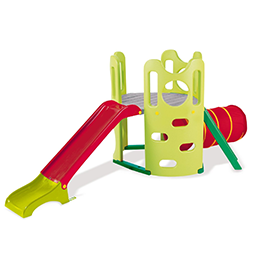 Once your child is over about 3 years old, they won’t be as interested in shape sorters. However this wooden farmyard will continue appealing to older children because they can play with it as an actual toy farm, rather than as a shape sorter. 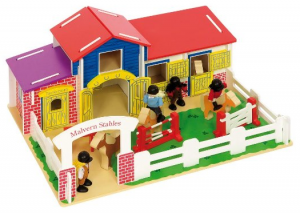 The Bigjigs wooden farmyard set consists of toy riding stables with 12 pieces: stable, 4 figures/dolls, 4 horses, 2 horse jumps and a saddle rest. Children of different ages will enjoy pretending to run a riding school, making the toy figures look after and ride the ponies. The doors open and close, there’s a fun hay loft and plenty to keep children entertained. Like many wooden toys, the materials in this farmyard set are responsibly sourced and have less environmental impact than most toys. 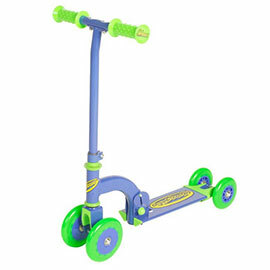 It measures 60cm wide by 27cm high, so it’s a nice big set for little fingers to play with. There’s a bit of conflicting information on Amazon – it says it’s suitable for children aged 6 months to 3 years, but a separate warning says it’s not suitable for children under 36 months. 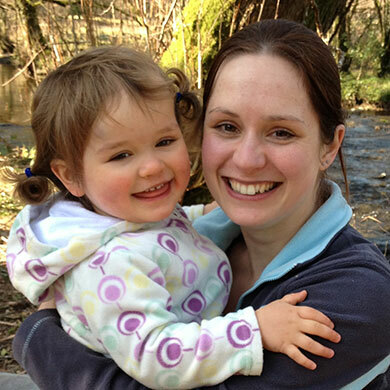 It’s therefore worth checking before you buy it for very young children or 2 year olds. If you don’t have room – or the budget – for a complete wooden farmyard set, then most children will have just as much fun with a set of farm animals. The Tidlo Animages Wooden Farm Animals set is pretty cute as you can mix and match different parts of the animal. For example putting the pig’s head on the horse’s body – guaranteed to entertain! The set includes 7 wooden animals (sheep, cat, horse, dog, pig, cow and chicken) plus a bush and crop. The pieces of each animal are held together with magnets, and children of 2 years old and above will enjoy working out how to separate and combine them. This farm animals toy is designed to develop children’s thinking and reasoning skills as well as their hand-eye co-ordination. It’s suitable for children aged 12 months and up, although personally I think it’s a bit old for 1 year olds. Goki’s set of wooden farm animals includes a realistic-looking animals – 2 horses, a cow and calf, 2 chickens, 1 rooster, a pig, 2 piglets, a cat and a dog. The animals are tasteful and realistic, while still colourful and fun to look at. 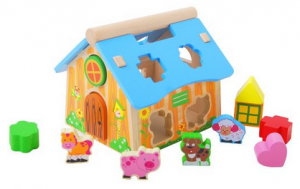 This wooden farm animals set is designed for children aged 12 months and above. I think it will be of interest to much older children too, because the animals can be incorporated into more complex imaginative play. The animals are very robust, won’t break easily and should last for many years. They have 4.7 out of 5 stars on Amazon which is very good for a toy of this type.